What Should You Do With All Those Leftover Peeps? 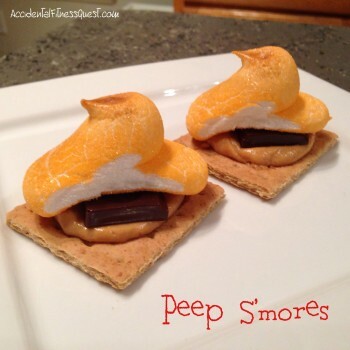 You are here: Home / Desserts / What Should You Do With All Those Leftover Peeps? Preheat the broiler on your oven and line a cookie sheet with foil. Break the graham crackers into 4 squares. Measure the PB2 and add just enough water to make a spreadable consistency. Spread evenly onto the 4 graham crackers. Top the PB2 with one square each of the dark chocolate bar. Place a Peep on top. Arrange the graham crackers on the foil and broil for just long enough to slightly brown the peeps. Don’t step away because this will happen fast. Remove from the oven and enjoy.